USANA, word! : USANA Biz Centre: What Do You Tweet About? People love to give their opinion, especially on topics like health and well-being. Instead of posting a link to a product, you could ask your readers what they do to keep fit over winter. Questions encourage discussion and friendly banter, which leads to your followers trusting you. If you look to the right of your Twitter screen, you'll see a list of trending topics – these are the most popular tweets on Twitter right now – commenting on these topics will get your name in front of the thousands of people talking about them – if you're entertaining, you might get lots of new followers. Many groups hold discussions and chat sessions on Twitter using #hashtags. You could participate in interesting discussions – you might answer some questions about USANA products or help other USANA Associates set up their business. If you help people, they'll remember you as someone genuine and friendly and will want to follow you. People love to find interesting, entertaining and thought-provoking articles and websites. Whenever you post a link to an article or blog post, include the author's @username in your tweet, so they can see you spreading the word about their website – they may want to give you a shout-out in return. If the originator is not your follower, then chances are that he/she will follow you after the re-tweeting. The more you use Twitter, the better you understand what techniques are the most effective for increasing your followers. 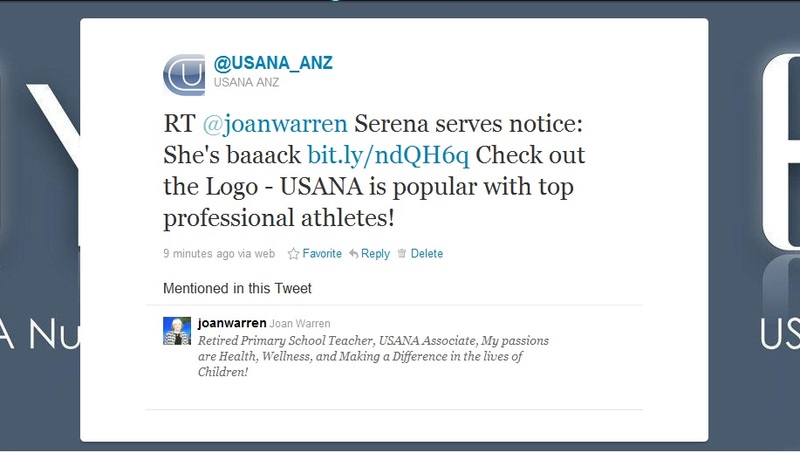 So don't be shy, come join us at @USANA_ANZ and let's tweet up a storm!